The Nigerian Security and Civil Defense Corps (NSCDC) and other security agencies have arrested a woman at the Internally Displaced Persons (IDP) camp in Dikwa town of Borno for allegedly killing her newborn child . 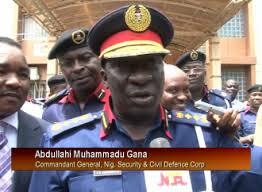 The NSCDC Commandant in Borno, Mr Ibrahim Abdullahi, told the News Agency of Nigeria (NAN) on Wednesday in Maiduguri, that the incident occurred on the 1st of June this year. Abdullahi said that the woman, aged 30 (name withheld), allegedly killed her baby by throwing it into the pit in the camp after she gave birth. “Immediately she committed the atrocity, she left the camp. Our attention was drawn to the dastardly act after three days when the corpse started smelling in the pit. “We conducted our investigation and were able to trace her through a man named Gulumba , the person that brought her to the camp. “The case had since been referred to the Borno police command for further prosecution and interrogation. “This is not the first case; IDPs on several occasions had been caught indulging in all sorts of anti-social behavior, like prostitution, murder and illicit drug abuse, among others,” he said.